Ambiguity and uncertainty are natural byproducts of change. Yet we know ambiguity and uncertainty can kill productivity and squash culture. How do we overcome this tension and embrace a future of rapid innovation and accelerating change? Transparency. In a great article for Fast Company How Radical Transparency Kills Stress, neuroscientist Dr. Robert Sapolsky discusses how "the damage [from stress] comes when people are marinating in anticipation, in the threat menace, which can last for months or years. It's the anxiety over the future that has the worst effect." The article suggests that radical transparency reverses the stressful effects of uncertainty on organizations. In fact, a trend toward organizational openness was also one of the key insights of the 2013 IBM CEO Study, which showed that 27% of CEOs have abandoned command-and-control approaches for organizational openness in the last year. 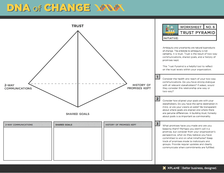 Leaders of change should spend at least 30% of their day engaged in activities that reinforce the trust pyramid. âEstablish a tempo of activity. âMake the unpredictable predictable with a steady cadence of open communication and transparent program structure. Like the rafters in this image, don't let change feel like going over a waterfall. Break the drops into stages for your team. Creating a familiar rhythm (e.g. learn/try/evaluate or open/explore/close) can make even the murkiest of futures seem manageable. Make progress - success and failures - visible. Transparency doesn't require perfection, but it does demand responsiveness. Teresa Amabile's fantastic research in The Progress Principle shows that the single most effective predictor of employee satisfaction is visible daily progress. Create a central space (physical or virtual) that features daily small steps toward the goal. No matter whether your team experiences steps forward, backward or sideways, a firm commitment to visible communication reduces anxiety and helps your organization focus on the next step.